Life's changes bring good days, bad days, and everything in between, but for women going through menopause, hormonal fluctuation can make every day situations unpleasant. When menopausal symptoms become severe, they can have truly detrimental effects on daily life. Open communication is the first step toward finding a solution, so read on for some tips on when to seek help for menopausal irritability. As you go through menopause, both irritability and surrounding circumstances can be enough to prevent a full night of sleep. One of the leading causes of irritability is excess stress, and an anxious thought life can keep the brain from entering sleep mode. If getting adequate sleep becomes a regular problem, it's time to talk to a healthcare professional about possible stress-reduction methods, as sleep deprivation can significantly worsen irritability. Everyone has a different set of pet peeves and level of tolerance for frustration or annoyance. Menopausal irritability, however, can result in aggravation at the smallest of issues, causing angry reactions to things that were not bothersome before. If every little thing starts to become a major irritation, it's a good idea to seek additional help. Lacking patience is not necessarily abnormal, but sometimes menopausal irritability can intensify reactions to an extreme degree. Snapping, yelling, and simmering in anger may result from what are usually simple frustrations. If you find yourself reacting this way regularly, it may be time to share your experience with someone who can help. Those who experience increased levels of frustration may choose to completely avoid situations that provoke a reaction, whether consciously or not. This is an effective solution in isolated cases, but menopausal irritability can be so severe that you alter your daily routine to stay away from most stimuli. If you're avoiding people, events, or public places at all costs, the next step is to seek assistance. Close family and friends may be able to tolerate the worse of your moods, but it's also true that everyone has a limit. Menopausal irritability may spark arguments over insignificant issues on a regular basis, creating new tensions between you and your loved ones. It's important to seek help, so it doesn't come between you and the people you care about. These days, most people spend the majority of waking life at work. It is essential to overall happiness, therefore, to at least get along with your colleagues and feel productive while working. When work performance suffers, stress can exacerbate menopausal irritability, affecting your overall well-being and possibly hurting your career. Talking to someone about this issue can help you get through it and maintain your equilibrium at work. 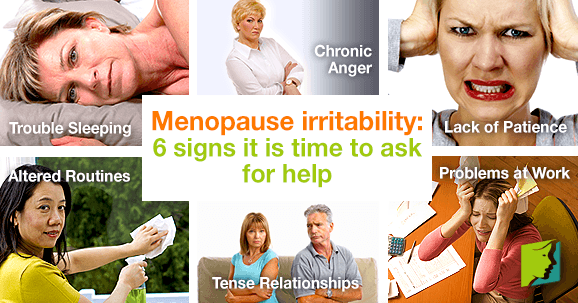 Acknowledging the signs of menopausal irritability is the first step toward finding relief. With the help of a doctor, therapist, family, friends, or all of the above, you can discover the lifestyle changes and other methods that will return your peace of mind. Talk to someone today to start working through this difficult symptom. For further information on how to deal with irritability and others menopausal symptoms, click here. Chocolate has many possible health benefits,such as the ability to boost mood and reduce irritability. Keep reading to learn the truth behind this claim. Read all about five common symptoms of menopausal irritability here so that you can start to live a more emotionally stable life.